I want to remark at the beginning of this post that I love math people. We’re a little weird, very friendly, and generally quite open-minded and supportive (at least, this is true of the math people I know, a.k.a. geometric group theorists and friend fields). There’s one thing that really, really bugs me that many (definitely not all) math people do when talking math with each other. Also, I’m really into lists right now. I dislike this so much! I’ve heard very many mathematicians say this over the past few weeks, whom no one would call “slow.” One reason for my distaste ties in with the whole “women apologize more” bit, explored in a Pantene ad, dissected by Time, and perhaps most effectively explained in this spoken word video. I’m devaluing my contributions to this conversation. If I don’t take myself seriously, how can I expect you to? By saying these words aloud, whether I believe them now or not, I convince myself and you that I am, in fact, slow. Just like if I looked in a mirror everyday and said “I’m ugly” I would eventually believe it. I’m perpetuating a system of these apologies- now whenever you’re in a conversation and struggling to understand what’s going on, you’ll be tempted to say “sorry, I’m slow” and cause 1-3 to happen to you. Maybe the worst part of “sorry, I’m slow” is that there are good reasons to say it: when faculty/those further along say it, it encourages undergrads/younger folks that they aren’t the only ones who feel this way. Similarly, if you say it in a group of peers, it builds camaraderie (in the way that teenage girls insult themselves in order to get compliments from each other). When younger people say it to older people, mentorship instincts kick in and older people often share personal stories of some other time they felt slow. Really what I’m saying is that “sorry I’m slow” is bad because it makes you believe that you’re slow, and it’s good because it tells everyone else that you also think you’re slow. I just wish people didn’t pass these value judgments on themselves. =( I suppose this post is why I’m a mathematician, not a psychologist or sociologist. From here: http://cheezburger.com/5218979584. 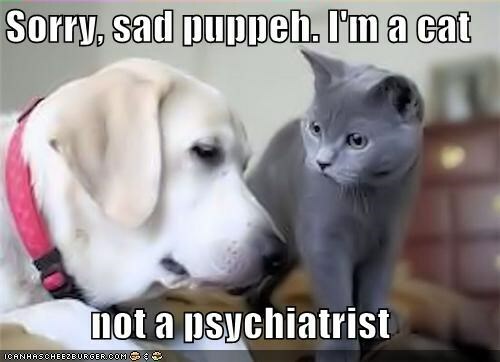 Also, I’m the puppy and the cat. Great post! It’s frustrating to think about how many people give up on math because they get lost early on, and don’t feel comfortable asking the basic questions that they need answered, let alone asking the question and apologizing for it. Ironically, I think when I hear someone ask a basic question unapologetically, I assume they must be really smart – i.e. they must know a lot about other things if they’re confident enough to admit their ignorance about this one topic.